Traumatic injury of the elbow joint is divided into bruises, fractures and dislocations. The following types of fractures elbow: fractures of the lower epiphysis of the humerus (isolated fractures Razmyslov and condyles, T - and U-shaped fractures condyles), fracture capitate exaltation, fractures of the upper epiphyses of the bones of the forearm (the elbow and coronary processes elbow bones, head of the radial bone), combined fractures of the lower epiphysis of the humerus and the top of the epiphyses of the bones of the forearm (broken internal condyle and head of the radial bone and others). When injuries, fractures and dislocations of the elbow joint impose rear plaster of Paris splint is placed from the toe to the top third of the humerus (arm is bent at the elbow at 90 degrees). Therapeutic physical training at all traumatic injuries of the elbow joint is appointed on 1-2 day after the injury. When the injury of the elbow joint on the background of General developmental and breathing exercises use special exercises for damaged hands all free of immobilization of the joints, as well as exercises in sending nerve impulses immobilized in the joints. The timeframe depends on the strength of the injury or the degree of stretching ligaments. After removing immobilization are assigned: medical gymnastics, gymnastics in the water and physiotherapy, which contribute to the restoration of the movements in the elbow joint. The recovery time (approximately) from 2 weeks to 1.5 months. Sport training resolved by physician individually 3 months after injury. Fractures of the elbow joint happen without bias and offset. Fractures without bias immobilizer back plaster Longuet (arm is bent at the elbow at 90 degrees). When displaced fractures (except for fractures of the olecranon) produce a manual mapping of fragments or operational reposition with strong fixation of fragments of metal needles, screws or bone pins and immobilization back plaster Longuet. When conservative treatment of fractures of the olecranon impose rear plaster of Paris splint is placed in the position of flexion of the elbow angle of 150 to 160 degrees, and at the operational reposition - knit olecranon - angle 100-110 degrees. After a dislocated elbow joint is resetting it and fixing of rear plaster Longuet in the position of flexion of the elbow at 90 degrees angle. Therapeutic physical training is conducted in three periods. The first period is divided into two stages. At the 1st stage (absolute immobilization) on day 2 after a fracture or set of dislocation on the background of General developmental and breathing exercises are assigned exercises for free from the plaster of the finger joints and shoulder joint, and treatment provision (the hand is laid on the pillow behind his head or in the position of lead - to combat the swelling of extremities, pain syndrome, to improve the circulation of blood and lymph circulation); sending pulses in immobilized joints; isometric tension of the muscles of the shoulder and arm; ideomotor movements in the elbow joint. At the 2nd stage when razbortovanny the Paris splint is placed on the forearm (according to the dates indicated by the doctor), but these exercises are performed flexion and extension in the elbow joint within gypsum (35-45 degrees). In the second period, after removing immobilization, include exercises for the development of the elbow joint in the following assumptions: 1) sitting shoulder sore hands laying on the table (the table is in the armpit), forearm in a vertical position (Fig. 16) - the flexion and extension in the elbow joint (pinkie should projection paralleling the ear lobe); 2) sitting, forearm is on the table (Fig. 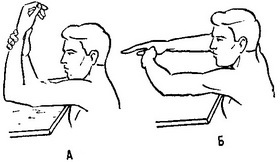 10,5), in the fingers children riding toy - locking shoulder, sick "longer" forearm using toys; 3) whether sitting or standing exercises on the block - bending and straightening of the elbow; 4) sitting or standing - various exercises with a cane, rubber or volleyball ball; 5) sitting exercises in warm water (10 - 15 min at a temperature 35-36° 2 times a Day (morning and evening); 6) standing or sitting with the torso forward - bending and straightening of the elbow performed friendly with a healthy hand, bending and straightening of two hands on the vis, flexion and extension in the elbow joints, taking them "the castle", lifting them on the head, behind the head, and so on, In the II and III periods are exercises in water; bending and straightening, pronation and supination of the elbow. In the treatment of fractures of the olecranon in the II period, you cannot force the function curl, because there may be re-fracture. In the II period fractures treatment of coronary process should perform exercises on the bending of the forearm, as they contribute to the healing process. In the third period when the restriction of movements in the elbow joint, especially after dislocation, it is recommended physiotherapeutic treatment (mud, paraffin, ozokerite), followed by re-therapeutic gymnastics. Studies should be carried out 4 times a day. The number of repetitions of each exercise in all ages 4 - b time. Classes are held 4-6 times a day. Any fracture or dislocation of the elbow joint is contraindicated passive movement, fatigue muscles, carry heavy bags, vises, stops, exercises, causing pain. All this can cause swelling, pain in the joint, reflex contraction of the muscles, calcification of the muscles, growth of bone deformities: "moustache", "spurs", etc. On all stages of treatment is contraindicated also massage.